Here I am nestled among the pines and the lakes of Michigan’s Upper Peninsula, thirteen-hundred miles inland from the cove in mid-coastal Maine where I spent my childhood summers; here I am walking the shores of the largest body of fresh water on earth, and it is the salt that I smell and the tides that are on my mind. They were a sure thing when I was young, the tides, that is — the way the ocean was either pouring itself into the cove or it was drawing back out again into the wide open sea. My siblings and I knew that the rhythm of the tides depended on the cycle of the moon, that full and new moon tides were the highest and the lowest, and that each day within that monthly cycle the time of the tides would vary. 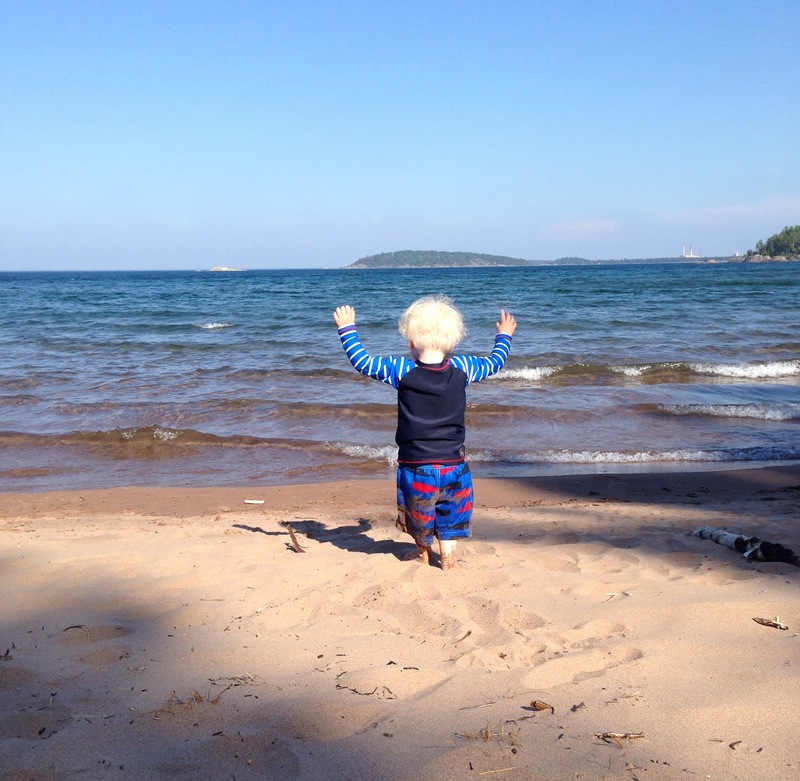 And we knew, even as young children, that the tides at our cottage doorstep brought a rich abundance to our lives, that the coming-in tides and the going-out tides each contained treasures that were ours to savor. And the low-tide treasures and those that came to us as the tide rushed back in couldn’t have been more different. Low tide was a treasure chest for sure. As the water pulled out to sea, our small beach at the head of the cove became our very own gigantic sand box, a place to scrounge for empty boatshells and periwinkles, for sea-polished stones and green-colored glass, and for stranger things too — the soles of old sneakers and rusty discarded toys and funny-shaped pieces of driftwood. We played in the sand, dug deep holes and found the sticky gray clay underneath, created forts and castles and roads for our trucks, and when we tired of the beach, we headed for Sister Point, to the very tip of the point where we clamored over seaweed to the grandest tide pool of all. Tide pools were a wonder to behold! Mussels and starfish clung to the rocks, and periwinkles and boatshells, too, and the crabs, the tiny ones who had been hiding in the sea weed, skittered out and tickled our feet. We loved the tide pools. We loved low tide. But what about the in-coming tide?!? We loved that too! How could we not!?! The minnows and the mackerel fish whooshed in on the tide’s currents and we, the kids of the cove, swam like fish, too. Our sandbox became our swimming pool and we splashed in its waters. We floated on our backs and we dove underneath and we somersaulted and backstroked and flutter-kicked about. Life is vibrant when the tides are constantly changing. And we knew this when we were young — and I’m remembering it now as I open to this early summer here in Michigan’s Upper Peninsula. Even though I’m presently here several states inland from the sea, I’m feeling the movement of the tides this month, feeling two contrasting treasure chests of activities filling my days and my nights. And it’s not the pull of the moon that’s causing the rhythm of my time to be categorized in two distinct packages of richness, not the ocean pouring itself in and then out again that’s bringing me a flow of energy that is feeling ocean-huge. It’s something quite different. It’s an extended visit of family. Our son, daughter-in-law and just-about-to-turn-two grandson Viren arrived at the end of May, and, a few days later, our son flew out west for a month-long fellowship in California to write a book. 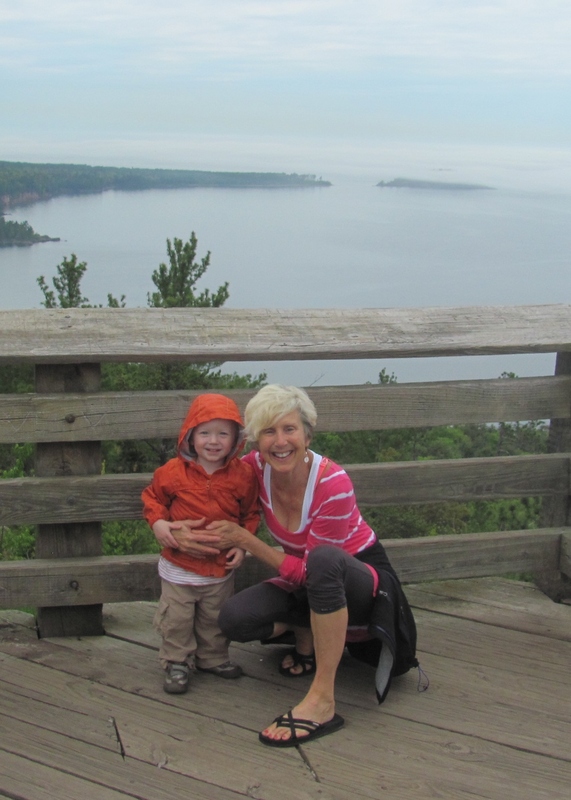 Meanwhile, our daughter-in-law and grandson are here in the Upper Peninsula this month of June, alternating their time between her family’s home and ours. I admit that I was a wee bit nervous. For some time now, I’ve been telling myself a story, that the reason that I can travel the globe with such finesse, trip after trip, each time landing back home on my feet and taking off running-and-playing at Joy Center is because I claim ample time alone. I’ve been telling myself that I need neat-and-tidy-hours-of-quiet-time-life in order to catapult out there into the wild edge of “the next-what’s next?!?”. And it’s true. I love the long hikes in the woods near my house and the hours of slow mediative yoga and the writing time where I can muse and clarify and work things out. The pauses ARE important. They bring me to that salt-soaked ocean-breeze place inside. And yet, when we were kids, we sopped it all up, the low tide exploration, the high tide splashes in the cove. It was all fun — and sure, we paused; many times a day, we paused; we caught our breath; we smelled the pines and felt the breeze — and then we forged ahead into the next moment and the next adventure, into the next tide, expecting that the good times would last. This month, I’ve been re-vamping the story I’m telling myself. Who says that the pauses have to be drawn-out? Who says that my energy has to go way inward in order to go back outward again? I’m drawing on those childhood summers in coastal Maine as my template for this new version of what a June can look like. Our energy seemed boundless as we scampered through those spacious days in Maine. And I’ve been surprised by my energy this month. I’ve been doing some present-day scampering of my own — letting go of my zen-ordered life and allowing the tides to flow, the tidal flow of Joy Center activities which has seemed extra vibrant to me these past few weeks, and the quite different tide spent playing with grandson Viren. Yesterday, a breezy hot Saturday, in the late afternoon, Viren and I drove to Wetmore Landing, one of my very favorites of Lake Superior’s beaches. Was it because the day was extra sweet and the breeze off the water was golden against our skin? Was it because the waves were gentle and the sand was silky and the blue sky seemed to go on forever? Or was it something else that was causing me to spill over with happiness? Was the little guy helping me to remember that the world is our treasure chest and it is not limited, that we can play to our heart’s content, that the tides are bountiful and our energy can be as well? Happy summer, everyone! Let’s play to our heart’s content! It was propped against a window sill in a corner of the old congregational church that is now used as a gathering place for events like ours, this high school fortieth reunion. It was a simple construct, this memory board with photos of our classmates, fresh-faced and eager and seventeen years old, taken the summer before our senior year at Morse High. I’m not sure how many photos were glued onto this board, perhaps thirty. Thirty!!! Thirty classmates out of the 200 of us had died, had left their body homes since our graduation day back in 1974, one an especially good friend of mine back then, a fellow counselor at Y-Day Camp, Elaine, bangs freshly-cut, smiling out at me from her place in the third row of photos. It happened right before I flew to coastal Maine for this reunion, two weeks ago now, on a Tuesday evening on a mountain bike trail in our hometown of Ishpeming, Michigan, that a beloved friend of my husband’s keeled over on his bike and died of an apparent heart attack. He had just finished creating this trail an hour before and was enthusiastically trying it out with a few of his friends. Carroll, a short jovial Scottish guy in his early sixties was a man of tremendous heart, a joy to the world; a joy to you and me. The day after his passing, 150 people showed up for the Wednesday Night Ride, a weekly ride that Carroll helped to birth seventeen years ago on the west end of Marquette County’s abundance of wilderness trails. This tribe of bikers slowly and ceremoniously rode past Carroll’s house in downtown Ishpeming and then crossed the highway to the trail that Carroll recently had created, the trail already marked with a beautiful wooden sign, “The Carroll Jackson Trail”. And after his funeral a week later, a packed event filled with story-telling and music and guys and gals dressed in their mountain bike jerseys, one of the main streets in Marquette was closed off so this tribe of people who love to bike and love Carroll could follow the hearse to Carroll’s favorite local brewery where the story-telling continued. Stories connect us and they heal our hearts and they bring the past into the present. In November of 1991 I attended the Common Boundary: Sacred Stories Conference in Washington DC where I was mesmerized by a majestic woman with a deep and booming voice who was speaking to us, the audience of over a thousand people. “We live in direct relation to the sheroes and heroes that come before us,” she said. I felt it then, the truth of Maya Angelou’s words, and now, over twenty years later, I feel it even more profoundly. I, like Maya Angelou, take them with me, my mother and my father, my aunts and uncles and grandparents, the poets and writers and artists who have inspired me with their creations. I take them with me, or maybe I don’t take them at all; maybe they come of their own free will, breathing life into my own creations and moments. This feels right to me, to connect, not only with stories and memories of the past, but also in this living breathing way with those who have come before me. But what about connecting with those who have walked beside me, my peers in this lifetime journey who have left their body homes? There was a moment at our reunion, when the music stopped, and our classmate, Earl, with his booming voice, took center stage. He lifted his glass to the heavens and instructed that we do the same. And we toasted to those who were no longer with us, those thirty or so classmates who were now pasted on the memory board in the corner of this gathering place, those who, in Earl’s words, were gone. I couldn’t quite do it. I can’t bear to think that way. And it doesn’t ring true to me to think that way. Are they really gone? Or does our thinking that way make them seem as though they are gone? I know my mother’s not gone. I’ve known this since her passing two-and-a-half-years ago. She makes her presence known in subtle and in not-so-subtle ways. She, the bird lover, often brings her love to me on the wings of the birds, especially in messages from the cardinals. It was this past Mother’s Day in Knoxville, Tennessee, the day after our son Chris’s wedding that I was filled up with my own sense of motherhood, not thinking of my mother at all as I walked down a street lined with blooming magnolia trees. As I reveled in the fullness of the moment, a cardinal flew out of a magnolia and landed on the sidewalk across from me. The cardinal and I looked at each other and then I continued walking, and the cardinal continued walking, too. For one city block, one whole city block, the cardinal, on one side of the street and me on the other, walked together, and I knew it was my mother speaking to me. This kind of thing happens all the time, especially when I’m already feeling filled up and receptive. Cam misses his friend, Carroll. He misses the trail reports and the bi-weekly biking dates. He misses Carroll’s easy laugh and boyish enthusiasm. He misses his physical form. My classmate Earl misses his friend Scott whose photo is pasted on the board. I’m sure for all of us at a fortieth reunion there was a sense of poignancy, a knowing that there will be a time when all of us are pasted up on that board. And yet, I have never had so much fun at a reunion. I have never felt so free and uninhibited around this group of people who I have known since childhood. I have never allowed myself to be so loud, to laugh so hard, to high-five with Earl that we are still, forty years later, the “most talkative” that we were deemed in our high school year book. I have never done the can-can before in a chorus line while a classmate sings “New York. New York”! I have never loved so fully, never felt so fully alive. And I’m pretty sure that those classmates, those ones with photos pasted on the board, were enjoying themselves too. 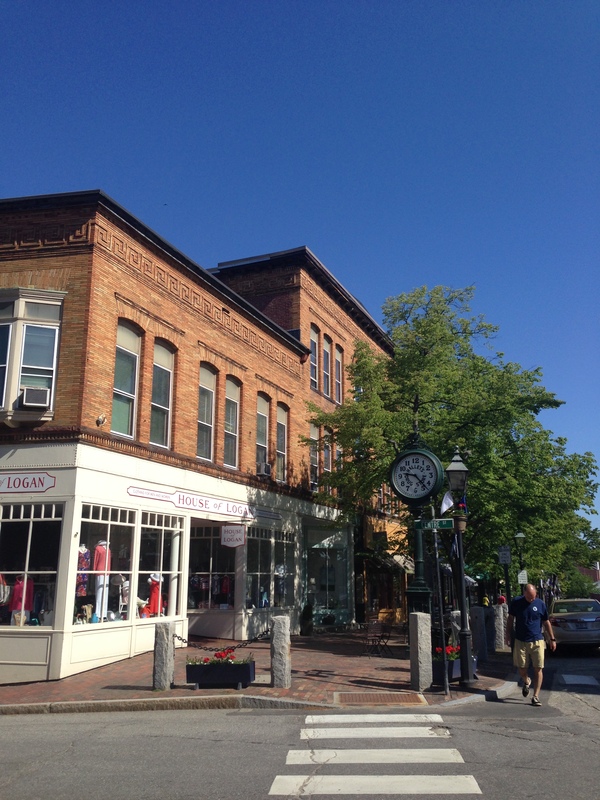 I’m sitting here at a corner table by the window in the Cafe Creme coffee shop sipping a blueberry smoothie and overlooking the intersection of Centre and Front Streets in my birth town of Bath, Maine. It is noon on this sunny Friday in early June. I know this because an old-fashioned clock stands tall on its cast iron perch in front of the oak tree on the wide-bricked sidewalk across the street, a clock that I remember from childhood when Hallet’s Drug store inhabited that building on that corner. Hallet’s made their own homemade ice cream, had a soda fountain and stools that swirled, and my father, who loved ice cream, would buy my siblings and I strawberry milk shakes and chocolate cones. As I tap the keys of my computer, my journal and my book of quotes lie on the table beside me, and, inside my journal, written fresh a few minutes ago, is a list of topics that I would like to explore in blog entries. This weekend, I have left my busy life back home in Michigan’s Upper Peninsula to fly east for my fortieth high school reunion. Well, maybe I haven’t left my busy life behind. Maybe I have carried it to Maine with me. Catch up on those blog entries, I tell myself. Write about the wedding that you and your husband Cam attended a few weeks ago, the one in Palm Beach, Florida, the one that you almost didn’t show up for because the two of you overslept and missed your plane, the one where you connected with friends you hadn’t seen since your twenties, the one that left the two of you stunned with an overabundance of openheartedness. Yes, that writing is definitely on the Maine-weekend-to do-list, especially that one because you don’t want to forget it, the way you dug deep into your determination and found a way to get down to Florida in time for the wedding because you both knew that, for some reason, you were supposed to be there. Write about it because it is a powerful story. And yet I don’t want to write about it right now. It feels like work. And I don’t want to work. I want to sit here instead and breathe in the sweet smell of freshly-baked scones mingling with the smell of coffee brewing. I want to watch the people: the little girl in the flowered sundress with the munchkin high-pitched bubbly voice who is leaning against her mother’s chair; the couple sitting on a couch in front of me bantering back and forth about what it means to be wearing certain colors; the man at the counter with sunglasses propped up on his balding head who might look familiar to me. It’s like that in a town that you once knew intimately but haven’t lived in since childhood. People seem familiar. You wonder whether the old man bent over his cane was once a middle-aged friend of your parents. And the teenager dressed in a T-shirt with a Winston Churchill quote on its back who is now waiting in line at the counter reminds you of a classmate that you had a crush on back in 1974. Sure, the past creeps into the present when you are lingering in a coffee shop across the street from the corner where Hallet’s Drugstore once stood. We were the Shipbuilders, that’s what we were called, we students of Morse High School, we kids who were raised in a town known for ship building for over two hundred years. And, in the early seventies, the years that I sailed through the high school waters, the ship we sailed in wasn’t so tight. The rules had loosened, the dress code had disappeared, the English classes became electives, the drinking age was eighteen, and we were free to smoke in designated areas. Our campus was open and, my senior year, streaking was the rage. And somehow, when I dropped out of my typing class sometime during that senior year, I wasn’t given an assignment in a study hall. Instead, it became a free hour for me. And when the leaves unfurled that spring and the dandelions blossomed and the air warmed up, I jumped ship each day and headed for downtown, to this very corner that I’m now looking out on. It was ice cream I was after, delicious homemade ice-cream that dripped down my chin, and the glory of freedom and the glee that I was getting away with something that was still against our school’s lenient rules. Sometimes I walked the four or five blocks alone; sometimes my friend Ricardo would join me. I’m not sure how he managed to leave campus mid-day, perhaps the faculty was even more easy-going with foreign exchange students, but I appreciated his company. And I wonder where he is now. And it is the “now” that I am interested in as I prep myself for this reunion. It is poignant to share history. When you gather with people who you haven’t seen in years, people who you knew when you were young, you can’t help but pull it up from the depths, their kindergarten face or their sixth grade walk or the story that is stuck in your memory’s net — the way Billy would flip his eyelids inside out and chase you and the other fourth grade girls around the playground, the way Curtis would do everything in his power to make you laugh in Mr. Brook’s sixth grade math class, the way Sally typed up your papers after you made that ill-advised decision to drop out of typing class. And when you walk into a gathering where these people are congregated, these stories make their way to the forefront for a moment, until you breathe deeply, until you bring it all into the present moment. And that’s what happened at the wedding in Palm Beach two weeks ago. It was the son of Cam’s best friend who was getting married, a friend who Cam has known since babyhood, a friend whose parents, both still alive and vibrant, have known Cam’s parents since their childhoods. And although Cam has kept in close touch with this friend through yearly hunting trips and frequent text messages, there were other friends attending this wedding who he hadn’t seen in years. And for me, it was longer still. When I first traveled to Cam’s hometown of Grand Rapids, Michigan with him after our first year together at University of Maine, Cam’s friends became my friends, and, for the first four years that we lived in Michigan after we were married, these friends were my rock. I had forgotten all of this, until this reunion two weeks ago. I had forgotten how much we care for the people who have been present in our lives. And I was astounded at how easy it is to catch up, to become current again, to bring that love for a person into the present moment. And what better place to do so than at a wedding or a fortieth high school reunion.